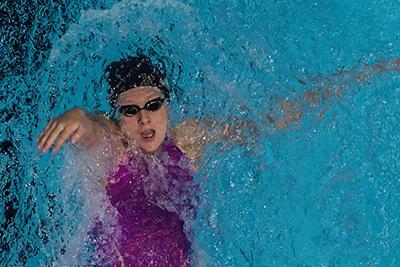 Julia’s swimming career started when she was nine years old, after watching the 2008 Beijing Olympics. Starting as a fourth grader, Julia transformed herself into an athlete strong enough to compete against world renowned swimmers. Competing at the Olympic trials was like no other competition she had ever swam in before. The stakes were high, but Julia knew what she needed to do to qualify. One one-hundredth of a second could separate a swimmer from heading to Rio or watching the games from home. Julia is passionate about swimming and has worked hard to get where she is today. However, she did not do it alone. With the support from friends and family, Julia was able to approach the trials knowing that her community supported her. The stress of the trials were lessened when Julia learned Cat was cheering her on from the stands. It gave her a bit of comfort knowing one of her best friends were pulling for her in the midst of the chaos. In addition to the support received from her friends and family, Julia also had a former Olympic athlete on her side. Henry Clark has coached Julia for three years and has watched her grow as an athlete. Clark has witnessed Julia’s achievements while pushing her when she felt that her times weren’t competitive enough. Being in an Olympic stadium was a whole new atmosphere for Julia. Seeing 20,000 people in the stands is something that many professional swimmers struggle with and was something Julia had never been exposed to. Not only was the arena different for Julia, but the way people treated her there was new for her. Almost every athlete has a pre-game ritual, this is no different for Julia. While Michael Phelps listens to music before a race, Tim Tebow shows his commitment to praying before every game. The Olympic trials are said to be more demanding than the Olympic games because of the amount pressure put on swimmers to succeed. “Top swimmers will say that this meet is more difficult than the Olympics itself since only the top two that place in each event at the trials make the US Olympic team,” Clark said. Though Julia did not advance to Rio this year, she gained experience and an understanding of how the Olympic trials work. Now Julia is training again as she prepares for the 2020 trials and a potential trip to Tokyo. Her ability to set her goals high and know what she wants to achieve in her swimming career has made her stronger in many aspects. Being a high school student and competing in the Olympic trials is something not many people get to experience.